The more I read, the more I am shocked at how powerful foods are. Curious about balancing your hormones, reducing asthma or eliminating migraines? Then you will be interested in the nutritional profile of flax seeds. Flax seeds are amazing for your skin. Consuming them can clear up acne. This is because the omega-3 fatty acids found in flax seeds can reduce inflammation in your body and your skin and acne is a kind of inflammation. Flax seeds also contain a very high level of lignans. In fact, among commonly eaten foods, flax seeds are the #1 source of lignans. 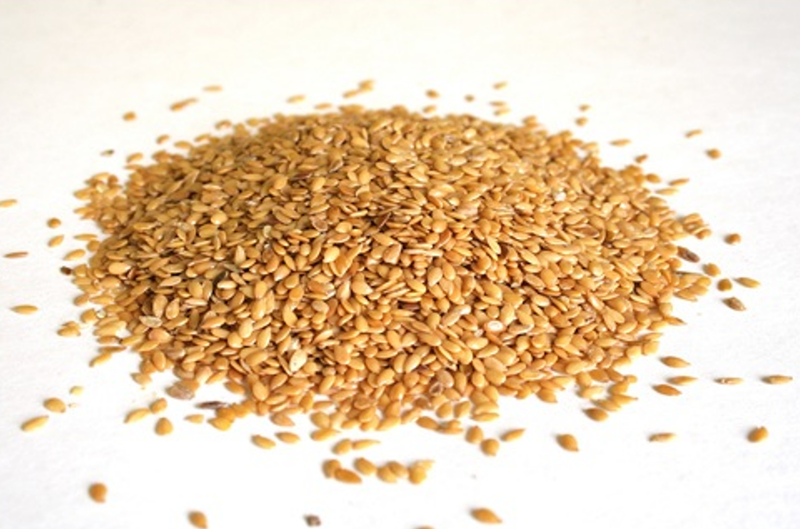 Sesame seeds are next on that list, and flax seeds contain seven times more. So what are lignans? They reduce the production of androgens, a hormone that when overproduced, can cause acne. The essential fatty acids present in flax seeds make the cell membranes of your skin stronger, which improves the hydration of your skin. This makes skin more resilient to hormonal fluctuations. The impact of lignans goes beyond breakouts. The lignans in flax seeds are a kind of phytochemical that can balance the ratio of progesterone to estrogen. For women whose hormones are out of whack, this can mean regular periods and the elimination of cramps, PMS, endometriosis, fibroids and cysts. In one study, it was found that flax seeds decreased anovulatory cycles, improving fertility . Once consumed, the body converts omega-3 fatty acids into prostaglandins. Prostaglandins act as anti-inflammatories in the body, essentially natural pain killers. This means flax seeds can help improve symptoms of inflammatory conditions like asthma, osteoarthritis, rheumatoid arthritis, migraines and osteoporosis. My friend Stephanie over at Bubble and Bee hasn't needed to use her inhaler since she started eating flax seeds regularly. The body uses omega-3 fats to produce substances that reduce the formation of blood clots. In many instances, blood clots are the cause of heart attacks and strokes. This means that consuming flax seeds can help prevent the cause of fatal cardiovascular events. In one study, it was found that eating 20 grams of flax seeds daily reduced cholesterol as effectively as statin drugs . I always knew pharmaceuticals had nothing on real food. So what's the best way to get all these benefits? The body can best absorb the nutrients in flax seeds if they are partially ground. Buy whole flax seeds and grind them yourself in a high powered blender or food processor. Or you can purchase preground flax seed meal. Make sure to store bulk in the freezer so it keeps for several months. Smell them before you buy and eat them. If you catch a whiff of fish, they've gone rancid, and all those valuable omega-3's are no longer useful to your body. Flax seeds can be added to nearly anything without altering the flavor profile much. Try replacing some flour in your baked goods with flax meal. Throw some in your morning oatmeal or granola; you won't even notice a difference. Or you can add them as a boost to your green smoothie. I like to take a slice of celery, spread a little peanut butter on it, and roll it in the flax seeds. It's like ants on a log! I recommend 2 tablespoons daily. I learned all about flax seeds from Stephanie Greenwood, the brains behind Bubble and Bee! Read her original article.